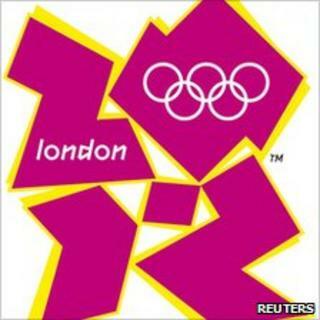 Image caption The Iranians claim the logo spelt the word "Zion"
Iran has indicated it will attend the 2012 Olympics in London, despite complaining that the Games logo resembles the word "Zion". Last month the Iranians complained to the International Olympic Committee and called for the graphic to be replaced. They objected on the grounds that its resemblance to the word Zion - a Biblical term for Israel - was racist. But now the Iranian-backed Press TV has quoted an official as saying Iranians will "participate gloriously". The report by Press TV quotes the secretary of Iran's Olympic organising committee, Bashram Afsharzadeh, as saying: "Our decision, to partake [in the] Olympic Games, has nothing to do with the UK politicians. "We will make co-ordination with officials of the International Olympic Committee and we will participate and play gloriously in London Games." In its original letter to the IOC, Iran had called for the Games logo to be withdrawn and its designers "confronted". There was also a suggestion that Iranian athletes would be told not to attend. At the time, IOC president Jacques Rogge told BBC Sport: "No, it can't be serious. We will quietly reply, telling [Iran] the logo has nothing to do with racism or any political connotation." The complaint was also dismissed by Prime Minister David Cameron, who said the Iranians would not be missed if they did not attend. In an interview with the London-based paper Jewish News, Mr Cameron said: "It's completely paranoid. If the Iranians don't want to come, don't come - we won't miss you. "It would be a crazy reason for not coming."